Two of Scotland’s leading disability charities have been recognised for the supportive environment they create for carers in the workplace. ENABLE Scotland and Sense Scotland have been awarded Carer Positive status. 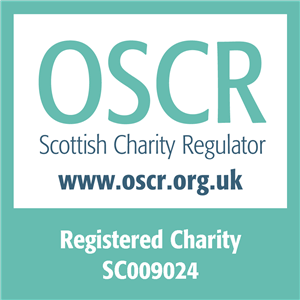 The Carer Positive scheme is operated by Carers Scotland on behalf of the Scottish Government and is awarded to employers who introduce working practices that aims to make life easier for those who have caring responsibilities. According to the charity Carers UK, 1 in 8 adults are caring for someone close to them – over three million of whom are juggling their responsibilities with employment. According to ENABLE Scotland and Sense Scotland, too often caring for others long-term can have impact on carers’ own wellbeing. Carer Positive employers understand this difficulty and put ‘carer friendly’ policies and working practices in place to help carers better balance their demands. Implementing such policies is also known to help employers achieve lower levels of stress, reduce sickness absence and boost staff morale and productivity levels. ENABLE Scotland and Sense Scotland join more than 128 other organisations from the private, public and voluntary sector organisations who have been recognised already as a Carer Positive Employer in Scotland, including Standard Life Aberdeen, NHS Lothian and the Scottish Parliament. 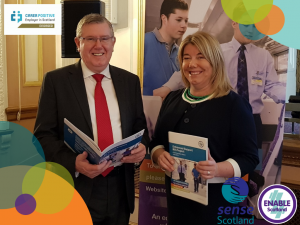 ENABLE Scotland and Sense Scotland recently launched an innovative Group structure, thought to be the first of its kind in the charity sector in Scotland, in order to accelerate change in improving the lives of disabled people and the dedicated staff who care for them. The new venture will see both charities share innovation, property and resources in an overarching Group structure, which means both charities retain their individual identities while working together to protect and grow frontline social care services across Scotland.